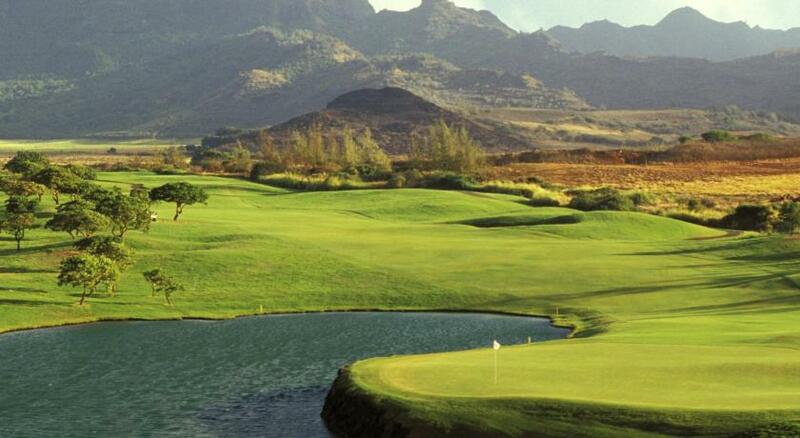 Lock in a great price for Grand Hyatt Kauai Resort & Spa – rated 8.7 by recent guests! I love staying here. The pool is amazing. The location is beautiful. The staff are great. Perfect. The restaurants had Vegan options which isn't that common, the gym was well equipped with about every workout possible. Pools were well designed and the hotel is truly promoting green as they provide water bottles instead of paper or styro cups and a reusable shopping bag. Great pool, comfy rooms, great restaurants!!! Amazing views!!!! The location is fantastic. Shipwreck Beach and the Mahaulepu Trail access is spectacular! The pool was well landscaped and it was great to have options (adult pool, lagoon, lazy river) for an easy day of lounging. The food was very good both by the pool and on the terrace. The breakfast room is the nicest I have ever seen. Great view of swans and the ocean beyond. The pool landscape with "Lazy River" and waterslide were a big hit with the kids. Grown ups loved the poolside food and drink service. The rooms are spacious. The hotel was absolutely superb. It is the nicest hotel I have ever stayed in. The employees were all very nice, helpful, and accommodating. Everything was clean and maintained. Breakfast was excellent along with the staff. Not only is this Hotel extremely beautiful and clean but, the staff were some of the nicest I have ever encountered. There were alway smiling and ready to help you with whatever you might need. The food and drinks were great! I will definitely be going back to the Grand Hyatt. Grand Hyatt Kauai Resort & Spa This rating is a reflection of how the property compares to the industry standard when it comes to price, facilities and services available. It's based on a self-evaluation by the property. Use this rating to help choose your stay! One of our top picks in Koloa.Set amid river pools and tropical gardens, the Grand Hyatt Kauai Resort & Spa features a golf course, 7 restaurants and a spa. Each guest room includes a private balcony. A flat-screen TV with cable channels, an electronics charging station, a beverage chiller, a seating area, and a large work desk are offered in each guest room. A marble private bathroom features double vanities, bathrobes and free toiletries. The Anara Spa and Salon features massage therapy, Hawaiian body and facial treatments and hair care. A lap pool and café are also available. A championship 18-hole golf course and pro shop, 3 tennis courts and pro shop, water sports center with equipment rental and horse stables are all located on site. A vast 24-hour swimming pool complex with waterfalls, waterslides and volleyball net is provided. An adults-only swimming area is also offered. When would you like to stay at Grand Hyatt Kauai Resort & Spa? ADA features like a bath tub with accessible hand rails are featured in this room. ADA features like accessible hand rails in the shower are featured in this room. This disability access room features resort views from the balcony. This ADA room includes features such as a bath tub with accessible hand rails. A cable TV is also provided in this room. This double room has a balcony, sea view and iPod dock. Bathrobes, air-conditioning and iPod docking station are featured in this suite. Please note: This room offers a King-sized bed, best suited for two adults, but the room can comfortably fit one rollaway bed for two more guests at an additional charge. Please contact the property for details. This suite has air conditioning, garden view and bathrobe. Ocean views from a private balcony is featured in this room. Partial ocean views from a private balcony is featured. A balcony, bathrobes and cable TV are provided in this room. Pool views are featured from the balcony in this room. Bathrobes and cable TV are provided. Bathrobes and an iPod docking station are featured in this suite. This quadruple room has a balcony, bathrobe and tea/coffee maker. This quadruple room features a balcony, tea/coffee maker and iPod dock. This quadruple room has a balcony, bathrobe and iPod dock. This quadruple room features a balcony, iPod dock and cable TV. House Rules Grand Hyatt Kauai Resort & Spa takes special requests – add in the next step! Grand Hyatt Kauai Resort &amp; Spa accepts these cards and reserves the right to temporarily hold an amount prior to arrival. Grand Hyatt Kauai Resort & Spa accepts these cards and reserves the right to temporarily hold an amount prior to arrival. Please contact property directly about breakfast rates. Rollaway beds are available for an additional fee. Please contact the property for details. The location, food and the pool area. The facilities generally were fantastic. Rooms need updating. Our old bathtub did not drain! Every time we showered we were standing in 10 inches of water in the first 3 minutes. Electrical outlets worked some times, and other times did not. Not enough lighting in room. Mattresses uncomfortable. 2 of the concierge staff were extremely rude and did not help us our at all. Seeing a waitress at the pool took over an hour every time. Even when we rented a cabana for the day, waitress was slow every day. Zero entertainment at nights. It's been 15 years since we've been to the property. It is gorgeous and in a gorgeous location. However, it's clear that the property has not been updated in a long time - e.g. panelling worn in the elevators and the rooms, old style lights in room, furniture dated, etc. We booked an ocean view room however looking out at the public beach/parking lot was not my idea of an "ocean view". The room was the furthest room you could be in on the complex, so if you forgot something, it was a hike back to the room. We should have asked for a room change. The luau was inside due to possible rain and do not recommend it. The grounds were beautiful. The pool and the lagoon were fun. The kids loved being able to use inner tubes and play volleyball. The concierge was fantastic with the best suggestions for activities on the island. The food and beverage prices are high even taking into account that restaurant prices in Kaua'i are generally expensive. the food quality is very good, and the portions at the pool restaurant are great. The valet fee is exorbitant and the staff was not upfront about it. Given the high prices for the accommodations and daily resort fees on top of that, it seems unnecessary. The other comparable resort on the island offers free valet. Our room felt tired and could use a refresh in linens, carpeting and paint as well as updating in the bathroom. The pool and adjacent beach are this resort's standout features. The Grand Hyatt in Poipu is a fantastic place to stay. The location on the south shore of Kauai is great and we had pleasant sunny weather. The buffet breakfast on the Ilima Garden Terrace was plentiful and the bread pudding was a special treat. We could see whales in the distance and enjoy the swans. For lunch we had a delicious chicken sandwich at the Hale Nalu poolside restaurant. The grounds at the Hyatt are gorgeous and there are many swimming pools to choose from. There is a path along the ocean for great views also. The free water bottles could be filled at the filtered water stations. The room and bathroom decor is just average. It was disappointing that not only the hotel's beach but all the nearby beaches were too treacherous (at least at the time of year we were here, in December) for my young teens to swim or bodyboard in. So, you end up using the pools and not swimming in the actual ocean. The restaurants were not all top quality. Donderos was expensive but excellent whereas Tidepools and Stevenson’s Library were less than mediocre. Would not eat at either of those again. The property is beautiful and the staff were friendly and very attentive.